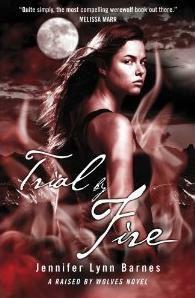 Trial by Fire is a welcome return to a fab werewolf series which I really enjoy. Things have changed for Bryn. She is now Alpha of her own pack and is in the unique position of being both a female and human alpha which from the outset leaves her in a somewhat vulnerable position but also one she takes in her stride. The best part of this book for me is Bryn. She is up against all the odds but always keeps it calm and thinks around the problems in front of her with a cool head ensuring that whatever step she takes is the best one for her uniquely female heavy pack. I loved how this book really gave Bryn a chance to shine while not ignoring that vulnerable edge that Bryn has that wants to help people and do what is best. The majority of this book revolves about the problem of Lucas, a wolf who has turned up on Bryn's doorstep with the claim that he is being abused by his own pack and the plea that he wants to join Bryn's pack. I liked how the story line evolved as the book went on and the insight you got into werewold politics especially when Bryn comes face to face with the other pack's alpha Shay. The book also had a new dimension added to it in that you are introduced to a coven who pose another problem for Bryn. They appear to have made some kind of deal with Shay's pack and are out to get Bryn. It was a really interesting way to add a bit of a paranormal dimension to the story and give the series its own unique twist. I won't say much about the storyline and where it goes as such because I don't want to spoil anything. All I can say is it is as action packed as the first book and there are some brilliant twists to the story several of which I genuinely didn't see coming. all in all a fantastic second instalment of the raised by wolves series. I can't wait to see what book three has to offer. Gah. Really must read the first book in the series. I met Jennifer Lyn Barnes and she's so lovely and really spoke about her books in such a fun and intelligent way that I'm sure I will love the books once I finally get to them! I really liked the first book and cant wait to read this one!